Pope Francis met leaders of several faiths in majority-Buddhist Myanmar on Tuesday, stressing the importance of “unity in diversity”. Pope Francis made no mention the Muslim Rohingya who have fled en masse to Bangladesh after a military crackdown. The leader of the Roman Catholic church will also travel to Bangladesh, where more than 620,000 Rohingya have fled to escape what Amnesty International has dubbed “crimes against humanity”. “Unity is always a product of diversity,” Francis told leaders of the Buddhist, Islamic, Hindu, Jewish and Christian faiths in Yangon. “Everyone has their values, their riches as well as their differences, as each religion has its riches, its traditions, its riches to share. Aye Lwin, a prominent Muslim leader who was at the meeting, told Reuters he had asked the pope to appeal to Myanmar’s political leaders ”to rescue the religion that we cherish, which could be hijacked by a hidden agenda”. Only about 700,000 of Myanmar’s 51 million people are Roman Catholic. 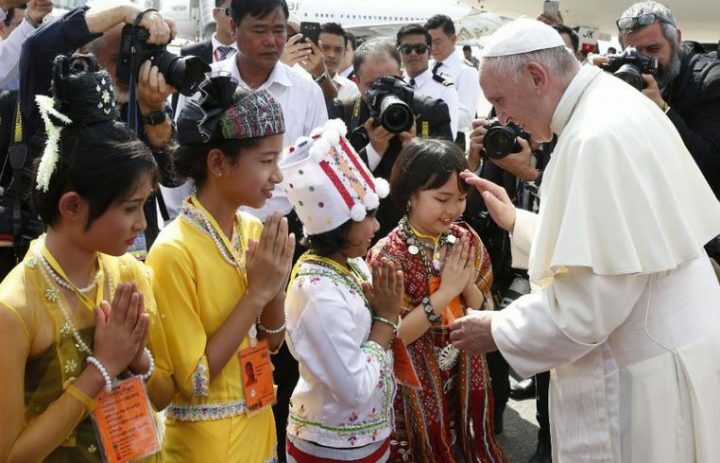 Thousands of them have travelled from far and wide to see him and more than 150,000 people have registered for a mass that Francis will say in Yangon on Wednesday. The pope was later flying to the capital, Naypyitaw, where he will meet government leader Aung San Suu Kyi, the Nobel laureate and democracy champion who has faced criticism from around the globe because she has expressed doubts about the reports of rights abuses against the Rohingya and failed to condemn the military. His trip is so delicate that some papal advisers have warned Francis against even saying the word “Rohingya”, lest he set off a diplomatic incident that could turn the country’s military and government against minority Christians. The pope is due to deliver a speech after meeting Suu Kyi. U.S. Secretary of State Rex Tillerson on Thursday called the military operation “ethnic cleansing” and threatened targeted sanctions for “horrendous atrocities”. Myanmar does not recognise the Rohingya as citizens nor as members of a distinct ethnic group with their own identity, and it even rejects the term “Rohingya” and its use. Vatican sources say some in the Holy See believe the trip was decided too hastily after full diplomatic ties were established in May during a visit by Suu Kyi.